YES ! There Really Is A Jimmy! In 1963, when Jimmy Antonopoulos immigrated to Canada from Nafplio, Greece, he brought 4 things with him: ingenuity, passion, an entrepreneurial spirit and a warm, hospitable smile! One of his first jobs, on moving to Toronto, was working in a restaurant in the Bay Street business district of Toronto. This is where his love of the restaurant business grew. As the city prospered, developed and expanded, Jimmy observed a void in the city core and shopping centres relative to the Quick Service Restaurant (QSR) market. In his view, there was both an opportunity and a need for high quality, healthy food prepared fresh daily and served in a friendly and efficient manner. Epikourion, Exquisite Greek Restaurant & Bar, a 225 seat full service licensed restaurant in Toronto’s First Canadian Place was Jimmy’s first restaurant. Opened over 30 years ago he is the only original tenant and often referred to as the “Mayor” of First Canadian Place. Jimmy’s initial success in Epikourion and other restaurant ventures gave him the confidence to act on another of his observations. Many office workers and shoppers who visited the food courts were not prepared to invest the time or the money for a sit-down, full service meal on a daily basis. As a result of this insight, our goal at Jimmy The Greek is to provide our customers with high quality, fresh and healthy food, served in a fast and friendly manner – offered at a competitive price point . The acceptance by the public of this goal and commitment was overwhelming. 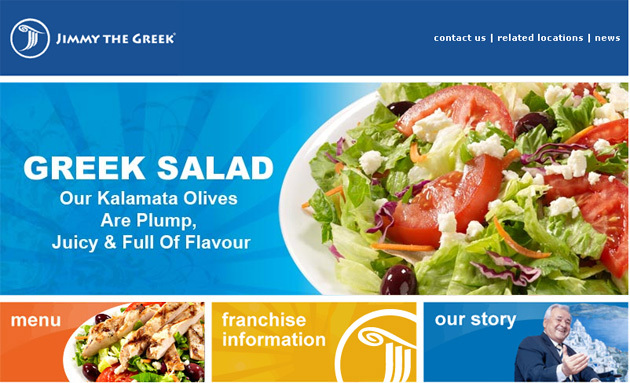 Today there are over 43 Jimmy The Greek food service operations across Canada. We have locations in Ontario, British Columbia, Alberta and in Manitoba. We are also in Dubai! Of course Jimmy gets the last word. “The success of our operations is a simple recipe: possess a burning desire to offer delicious, high quality fresh food, provide fast friendly service and do it with a touch of Greek hospitality.” YIA SOU!